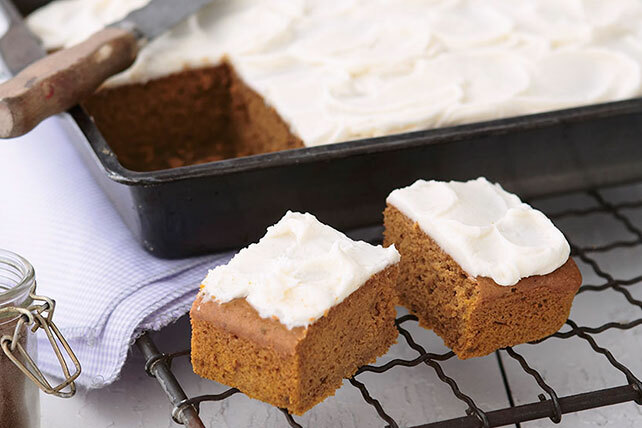 Use a spice cake mix to help you make these delectable Frosted Pumpkin Snack Bars. The kids won't want to go back to regular snack bars after enjoying this recipe! Don't forget to store these tasty pumpkin snack bars in the fridge. Beat first 4 ingredients in large bowl with mixer until well blended. Pour into 13x9-inch pan sprayed with cooking spray. Bake 32 to 35 min. or until toothpick inserted in center comes out clean. Cool completely in pan. Beat cream cheese, butter, milk and vanilla in large bowl with mixer until well blended. Gradually add sugar, beating after each addition until well blended. Spread over cooled cake. Prepare using 15x10x1-inch pan and decreasing the baking time to 20 to 22 min. or until toothpick inserted in center comes out clean.